Having spent most of his academy days as a central midfielder in ‘La Masia’, Sergi Roberto likely spent his adolescent years imagining how he would control the Barcelona midfield for years to come. Little would he know that an injury from starting right back Dani Alves would give him the opportunity to shine in an improvised position, as a right back. Ever since that day, Sergi has been considered as a vastly reliable performer at right back by 2 coaches: Luis Enrique and Ernesto Valverde. Not only has he surprised both coaches with his astonishing performances from the right defender position, but he has managed to beat new signing Semedo to the starting spot. All this during the season he was supposed to jump back into the central midfield position. Although he does have occasional minutes as a midfielder (can play any of the 3 positions in FCB’s triangle midfield), around ⅔ of his minutes this season have come as a right-back. Therefore, this article will cover both his qualities with the ball and his defensive performances from that position. Having said that, it is by no means assured that the future Sergi Roberto will not shine for years to come in the central axis of the pitch. Here at ESDF, we analyze base on events and facts, not on what might be or could happen. Now that you have a basic understanding of what position Sergi Roberto plays in, and also a brief outline of what this article will cover, let’s get into the desired topic of discussion: a player analysis on the ‘La Masia’ graduate. Although not considered a quick player, Sergi possesses immense acceleration speed that allows him to take off, with few people being capable of catching up to him. After thoroughly analysing his runs and accelerations, I’ve noticed a specific pattern in his runs. They are either out wide near the right wing, or from the wing/half space onto the central axis. In both, Sergi covers immense amounts of ground, allowing Barcelona to advance, progress, and transition quickly by many meters at a time. His runs and accelerations create many advantages for FCB, all which are stated above. With one run, Sergi Roberto manages to overcome Real Madrid’s aggressive (and risky) approach to their touchline press. Why risky? Well because the team was broken in 2, the touchline press was conducted very high up the pitch, and because it was the last play of the match. After overcoming the press and carrying the ball up the field, Roberto (normally) finds the teammate that is best suited to give fluidity to the attack. And I think every football fans knows how this play ended: with a last minute winner from Lionel Messi. Now, a closer look to examine Sergi’s run from up close. As Luka Modric presses him from Sergi’s left, he carries the ball with his right foot. After overcoming Luka, he switches to his left, to carry the ball away from Marcelo. Basic principles every footballer should follow, but not all do. Sergi’s spatial awareness, which will further be emphasised later in this article, is superior to most footballers. When most look once to observe the space around them, Sergi looks twice or even three times. Constantly looking up to observe the pitch around him helps him decide what scenario is best for the play to continue (Again, this will be further illustrated in the next section of the article). To show this was no improvisation, here is another example of Sergi conducting nearly the same play against Athletic Bilbao at San Mames. He overcomes 4 players with 1 run, before laying off to Andre Gomes. Now, a more direct pass following a 40 meter run from the ‘La Masia’ graduate. 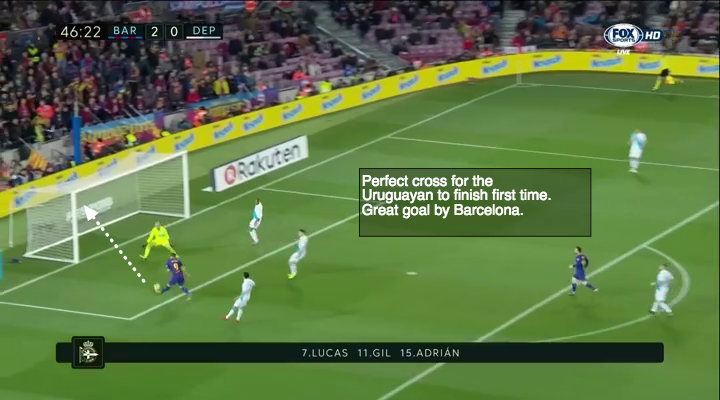 Differing from the 2 runs showed above, Sergi opts to put his teammate Arnaiz in an advantageous situation with a penetrative pass. Most of his long runs with the ball are from the half space deep inside Barcelona’s half, onto the central axis in the opposition’s half. Having said that, he rarely covers the same amount of ground down the wing. Covering so much space allows Barcelona to transition quickly, before Sergi finds a great option to keep the play going. A very valuable asset Sergi Roberto offers to Barcelona’s possessions is the constant penetrative runs behind the rival left-back to create advantageous situations for his team. Of course, he uses his positional awareness to scan the field around him and decide when to conduct any run, cover, pass, cross, etc. He picks his head up to observe the space around him 3 times in less than 3 seconds. After doing so, he decides the perfect moment when to fake to one side and sprint to the other. He now overcame Celta’s left back, but sadly, he has no crossing options in the box. This play simply illustrates 2 constant characteristics in Sergi’s game, runs behind rival full-backs and his positional awareness. Although not many, Sergi Roberto does possess some defensive flaws. First of all, he has a low success rate in 1v1 duels near the right corner flag, area that should be directly guarder by the right back (Sergi). Overall, his 1v1 defensive duels are average. His worst location on the pitch in that area, however, is the highlighted part. As shown, he fails in ¾ of his 1v1 duels in this area. Another significant flaw that could be noted was that he often jumped into pressure to quickly, leaving his team exposed at the back. Using the pass to the rival left back as a trigger to press aggressively, his anticipations rate of success often depends on if he gets the destination of the pass correct. Sometimes, he correctly anticipates the pass, leaving him in an advantageous situation to defend. Other times, that’s not the case. 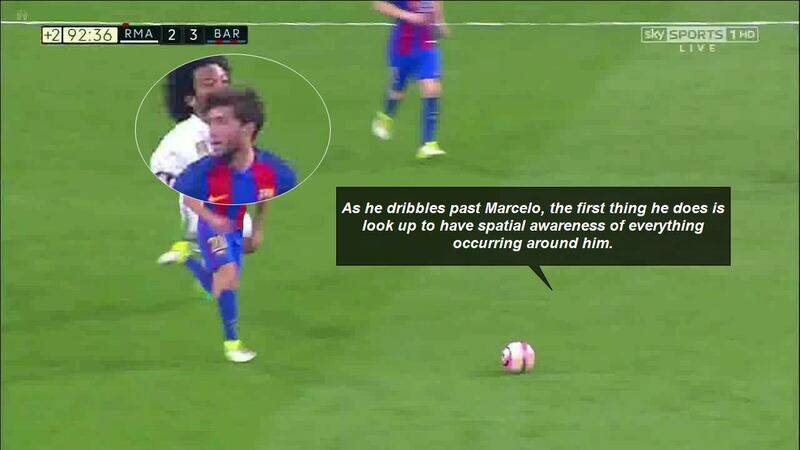 When he anticipates to quickly, he risks leaving Pique isolated at the back. If that happened to be a quick forward, he could easily overcome Pique and transition quickly towards Ter-Stegen’s goal. Barcelona’s rotations in attack have diminished every season since the Pep Guardiola era, however this routine play between Sergi Roberto and Messi seems to gain more importance as the understanding between the two gets better. As stated, this play is beneficial for Messi because he either gets to dribble inward or find Sergi Roberto behind the rival left back. This run completely baits these 2 rivals into following Roberto. When this happens, Messi is free to carry the ball towards the central axis. Now that you saw how Messi can dribble inward because of the outcome of the play, let’s take a look at the second possible outcome the play can yield. Like in the previous play, he has the space to dribble inward. However, he chooses to conduct the other possible outcome, to put Sergi in a dangerous position behind Olympiacos left back. This play was conducted more and more as the games went on, and each time, it happened to gain more effectiveness. No matter where the ball is, or what situation Barcelona are in, when in possession, Sergi always provides a wide passing option. Against compact mid-blocks, Sergi has massive space down the wing to cause damage. Notices how he (logically) asks for the ball to be played into the space. His deliveries from out wide have improved as he gained more experience as a right-back. His midfield vision gives him precise accuracy to find his men in the box. His ground crosses, however, are vastly superior to his aerial crosses. He manages to brilliantly find Suarez, who puts the ball in the back of the next. 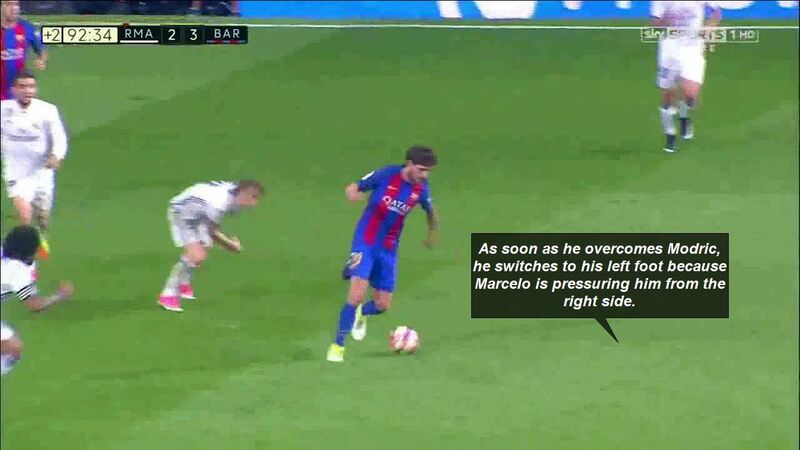 This is just one of many reasons why Sergi Roberto always provides a wide passing option. His wingplay is getting more and more dangerous as he continues to play most of his minutes in the right-back position. It’s quite evident Sergi Roberto is extremely valuable to Barcelona’s game plans. Not only can he cover loads of space with one simple run, he can also overcome rival full-backs, help FCB transition quickly, possesses immense spatial awareness, and always provides a passing option out wide for Barcelona’s possessions. Although his academy days were spent in midfield, Sergi just keeps on getting better and better as he gains more experience from the right-back position. As mentioned previously in the article, his acceleration is key to his 50-meter runs up the pitch. His attacking qualities from the wing are good, however they are not insanely superior to other attacking full-backs. His vision gained from his midfield days, however, aid him to send accurate deliveries into the box. His only significant weaknesses, jumping into pressure to quickly and losing 1v1 duels near the corner area.